For boar hunting we have developped as novelty a multi purpose pig sticker. The pig sticker can be easily screwed on top of a wooden shaft of approx. 1,50 m (approx. 60") length and is ready for use as boar spear then. With great concern we have to state, that successful and sought HUBERTUS switchblade knives designed and made in our facilities in Solingen are offered in the internet as fakes. 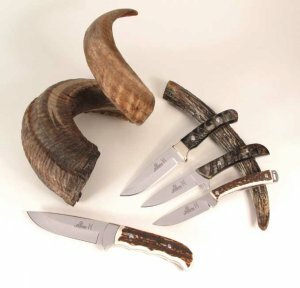 Our registered trademark HUBERTUS ® is used illegally on such knives. This one-of-a-kind directory in English language is covering the history of the German cutlery industry and is listing detailed descriptions of more than 1.400 firms with all their brandnames and trademarks. The book is illustrated with historical advertisements, reproductions from vintage sales catalogs and magazines, letterheads, photos and documents. Specific German terms used in advertisements, letterheads and firms' names are listed in a German - English glossary. As announced in June, Anthony Carter's English complete directory on German cutlers will be available soon. We are very pleased, that the US publisher granted us the exclusive distribution rights for continental Europe, while co-author John Walter will serve Great Britain, Ireland, Island etc. The book has a size of c. 25 cm by 19 cm, thickness is 4.5 cm (c. 10" x 7-1/2" x 1-3/4") and is listing more than 1,400 German cutlery makers and suppliers with the reference of more than 4,000 trademarks and brandnames. Some hundreds of photos from vintage sales catalogs, hundreds of cutlers' promotional advertisements and a lot of patent drawings are illustrting the directory. Our NEWS will be up-dated with additional information soon! We are proud that the association of Belgium falconeers' (Belgische Vereniging van Vlaamse Valkeniers en Havikeniers vzw) has ordered a limited edition of our classic style Nicker sheath knife customized for the special use of falconeers. This falconeers' association has a history exceeding more than 40 years www.bvvvh.be. 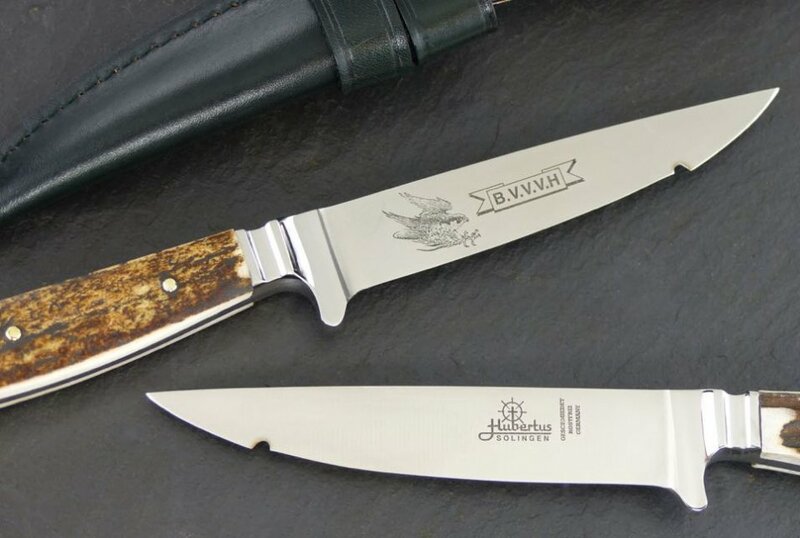 The back of the custom knife series is durably marked with that association's logo of a falcon along with the BVVVH mark. 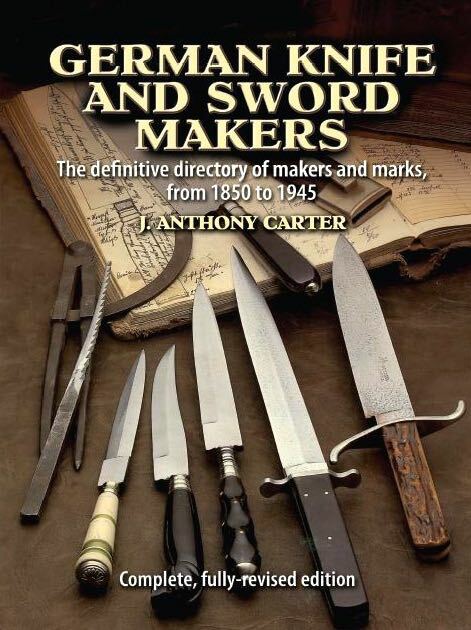 Anthony Carter's book „The Sword And Knife Makers of Germany 1850-2000 Vol. I“ is the most complete directory for researching the background of the German cutlery industry. It was published in 2002 and is no more available for several years. In co-operation with the British expert John Walter we could up-date and complete a full German A to Z cutlers' directory. We are completing our range of knife accessories with another belt pouch. Matching with the recently introduced smaller size pattern ref. # 19.050.LE.02 the large model can be carried on a belt vertically or horizontally. The tongue comes with two press buttons with the option to secure pocket knives of two different handle lengths. More than 1800 German fire brigades and emergency units are using our Hubertus Profi Rescue Tool in Germany only, additionally a large number abroad. 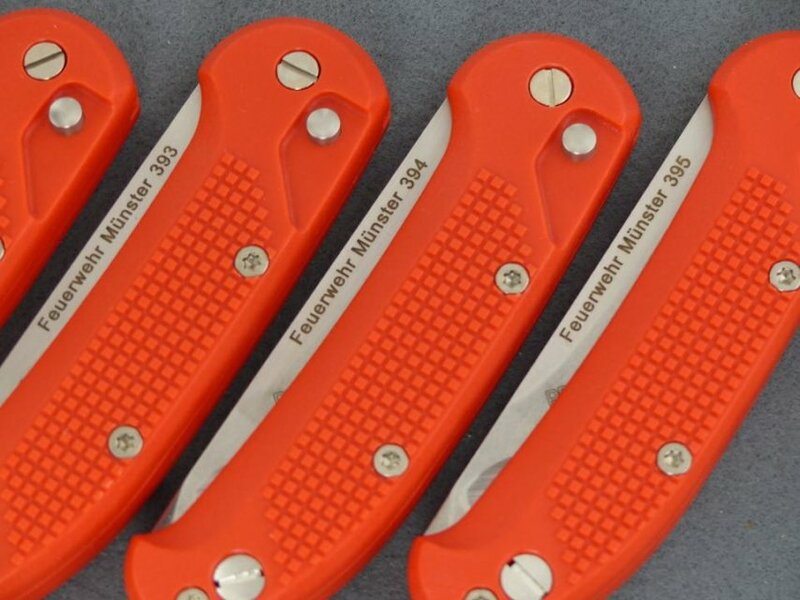 The "Berufsfeuerwehr Münster" (Professional Fire Brigade Muenster) is one of many customers, re-ordering our knives frequently. All this customer's knives are being marked with the fire brigade's name and an individually numbering. 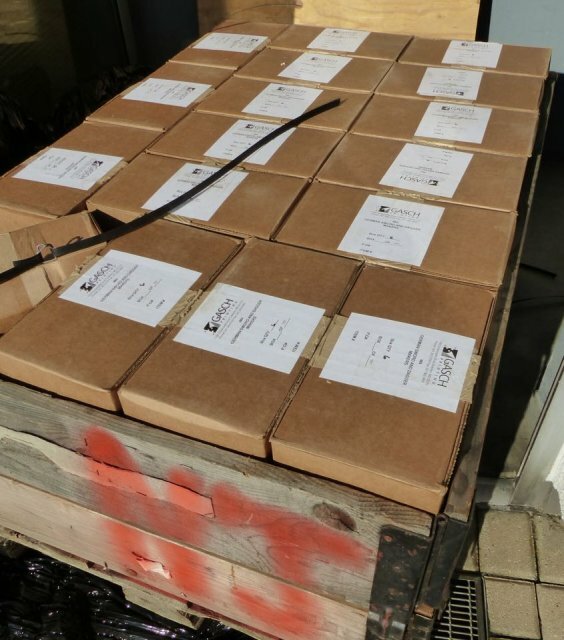 We could complete the latest shipment with Number 395 and are curious, if we will exceed the supply with number 400 still in 2015.